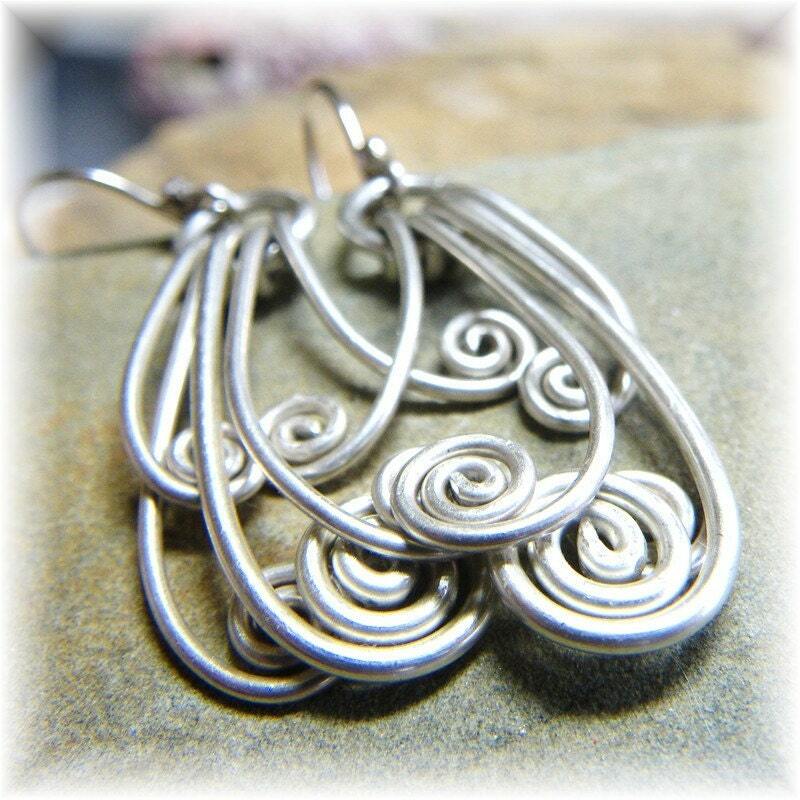 These simple sterling earrings are so comfy and unique that they will immediately become your favorites! I originally made myself a pair while messing around with different gauges of silver wire and a pair of pliers (all I had in my purse). My children, whom I always enlist for the naming of my items, said things like "aquarius," "wind," "waterfall," and "dementor." Two of them are 14 and avid HP fans! Definitely wind or water, so I felt like "spirit" encompassed both very well! These are showy and substantial while still showcasing your unique YOU! Incredible movement and style in this pair. My next pair offered will be oxidized, but these are polished for a shiny, more fluid appearance. But I'll happily oxidize if that's what you prefer (takes an extra day or two). I like these so much that I often have several pairs made up. I can't guarantee less than 14 days unless the title says "ready to ship." This pair is sold, so you will not receive the EXACT product pictured. ♥All metal is sterling silver, and I used three different thicknesses of wire. ♥Earwires are 20 gauge and handmade by me. ♥A tad over 1.5" long by roughly 3/4" wide, depending upon how they are "flowing." That is a fairly "closed" width. They move a LOT! Without jingling! The thick rings at the top of the watery spiral lengths are just over 1/4" across. Using the same lengths of silver, I could certainly make them a bit longer or shorter as a custom order without altering the price. Just let me know!!! Thanks for shopping Hillcountrysilver.etsy.com ! 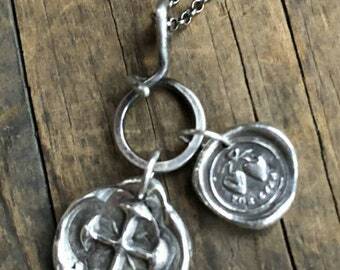 Unique and well made medic alert necklace! Love it! Beautifully packaged and great communication. Exactly as I wanted. Perfect! Thank you so much I love it! It is perfect just what I was looking for. Beautiful! I love it! Easily fit my charms & is exactly what I was hoping for. Notice that only the outer loop has the hammered metal look, the inner loop is smooth. Shipped promptly & packaged in a nice box with a very cute little bow. I currently accept PayPal, Credit Cards, money orders, and personal checks. If you pay via credit card, it takes a full business day for me to receive payment. PayPal is immediate. If you order something and do not pay for it at checkout, your purchase will be reserved for a week, and re-listed if payment is not received (unless we have made prior arrangements), maybe sooner if I don't get any replies to emails and/or convos. There will be no REFUNDS for PERSONALIZED ITEMS for obvious reasons. The stamping is all hand-done and will not be perfect! If you want perfect, go to the mall and get it engraved. I will begin stamping only after payment is received in full! If there is a problem with your order, please let me know so that I can fix it...(and I will in most cases)...before feedback is placed. Please see REFUNDS Policy below. My customer service is very important to me! I want happy customers who return again and again! CUSTOM, non-personalized orders may require a nominal down payment and the balance when ready to ship, and generally can be made and shipped within 1-2 weeks of your order. If I make a mistake in the stamping (please double check your notes to seller at checkout! ), I will pay for any further shipping costs to correct your order. Most of my business is return customers, so please don't ask for an additional discount. My prices are fair, even downright low sometimes, and I always take care of my great customers in some way! I value my time and my money, so I naturally expect that you value yours. But sometimes I see something out of my price range that I just MUST have! LAYAWAY is perfectly respectable. Let me know if you would like to split up payments and I will relist the item for you with divided payments. If items are not paid in full within 60 days, all payments are forfeit and I will withdraw your listing(s). Unless we make other arrangements. Please communicate with me. I prefer that payment is made in full within 30 days, but of course, I am open to other possibilities. Once again, items will not be shipped nor will custom items be started until payment is received in full. Buying jewelry is very personal. I want you to be happy with your new purchase. If you are dissatisfied for any reason, I will make it right. I will customize my bracelets, rings, etc to your requirements. Please check out my SOLD items for examples of custom creations and REVIEWS for Feedback on these items =). Below you will find specific issues and see how I address them, even if I haven't had to...yet! I cannot control the post office, nor do I wish to! But OCCASIONALLY something goes awry and packages do not arrive on time, at all, or arrive 3 weeks later totally mangled. I love the tracking feature and I use it! Just check your invoice and you will find it there. Insurance is available. If you still have not received your order thirty days AFTER SHIPPING, I will follow up with the post office. They will not even talk to me until 30 days have gone by! Please make sure your Etsy address is entered correctly. Your order may be delayed for clarification if I go to print a shipping label and the address is rejected. International shipping charges just increased (TRIPLED OVERNIGHT!) so I've had to change my shipping charges. I lost a lot of money that first month! I ship a lot of international orders, and generally go to the post office only once a week. This will either speed up or slightly delay the shipping date, as I try to plan on bulk shipping to save gas. I love toggle clasps! I have a huge selection and do not hesitate to use them for my own jewelry. But I cannot guarantee that they will not fall off or fail unless I have YOUR EXACT WRIST CIRCUMFERENCE! I will ask for this, usually several times during the course of working out the details for your personalized, OOAK bracelet, and often the closest I get is the length of your favorite bracelet. This does not work, as the size of stones, chain, clasp length, etc affect the inner diameter of the bracelet. I repeat: I NEED THE EXACT measurement to guarantee your bracelet. I made this mistake once. The bracelet, a gift for someone with "large" wrists, fell off within an hour and was never seen again. Turns out that the wrists were not too big, just that the recipient of this awesome gift was well-nourished. I replaced the bracelet at my own expense (ouch$$$), and changed my policy. I have lots of lobster and trigger clasps as well, and my handmade hook clasps are equally if not more awesome! WHAT IF YOU HATE IT? Fortunately, this has never been an issue! (Okay, a couple of times) If you hate it, return it and I will issue a prompt refund unless it is customized. If customized and I can reuse it, no problem! If not, perhaps you can keep the "Plate" and I can refund the rest at my discretion. Again, I am not perfect. And I hand stamp everything myself. So it likely will not be perfect, either. Please provide the information requested with your order and this should not be a problem. If no size is requested, I will send 7.5" bracelets (see above note) and 18" chains on the Mommy Necklaces. If you do not provide the size and you do not like it, you can return it and pay shipping both ways (an extra $3.10 will be billed to you on my end), and I will adjust the length. No Problem! Note that the size of stones and beads will alter the "inner diameter" of a bracelet, so a 7.5" bracelet with 1-inch beads may not fit an average wrist even though a simple chain bracelet of the same length will. I have a special mandrel I use to assure a custom fit if you give me your EXACT wrist circumference and how you like the bracelet to fit (snug, loose, standard "in-between"). This is critical for a custom fit. The first thing I do is check our convos and your notes to seller at checkout. If you made a typo on your child's name (yes, it happens more frequently than you might expect), I will gladly make you a new tag at your expense for the current going rate plus shipping. If I screw up (yes, I do that occasionally as well! ), I will make you a new tag promptly and ship at my expense. I apologize in advance, as it happens occasionally (well, twice so far). Please return the tag only (in the case of mommy necklaces) or the entire item (in the case of bracelets) in a BOX* or it will get crushed! so that I can fix it and return it to you. *If returning a broken chain or a single tag, it can be returned in a sandwich bag inside a regular envelope. Yes the chains are petite. That is one way I actually make any money at all selling jewelry! Upgrades are available at prices lower than stated on my shop listings. Etsy will not let me list "upgrades" without making the price the same to non-customers, but I figure you have already paid for the small chain, so you should get a better deal. Please contact/convo me if you would like a different chain. I have dozens of styles available and only a few listed. Additional stamped name tags are available without the chain ONLY IF YOU HAVE ALREADY PURCHASED a necklace from me! People keep having babies (I have four kids, I know how it happens! ), so I keep making jewelry. I do not list individual plates because my markup is too low to justify. But I am happy to make them for my valued and valuable existing customers. Jump Rings on Bracelets and Necklaces. Should you wish to remove a link on a bracelet, add a name tag to a mommy necklace, exchange the birthstone, etc, care should be taken to not distort the jump rings. Please contact me and I will send instructions on how this is best accomplished. I use mostly 16-gauge, heavy rings, so they are unlikely to distort or come apart without a pair of pliers or two involved! Thanks so much for checking before you buy! I truly appreciate it! I ship all items First Class USPS, which I have found is quick and inexpensive, often as fast as Priority Mail. Faster shipment options and shipping insurance are, of course, available for an extra fee. If you are a local buyer, let me know and we can work out delivery/pick-up for no fee in most cases. I'll refund via the means with which you paid. Etsy, so no more long-distance delays. I have an erratic work schedule with 14 hour days, which is why I list up to 2 weeks for custom orders. I always try to ship more quickly, but sometimes it cannot be helped. Let me know if you're in a real rush and I will do all I can to make sure your OOAK handmade jewelry gets out PDQ! CUSTOM order shipping: My current shipping times vary depending upon the season, holidays, and current height of my order stack. I make every attempt to ship custom items within 14 days of payment, but this may be delayed if I do not get replies to requests for clarification, payment for gemstone upgrades, etc. Please check my front page announcement : hillcountrysilver.etsy.com and click on the "read more" in the text at the top for current shipping times. Inernational Shipping: please note that some countries may charge import taxes and will collect these before releasing your package. I state actual purchase price on my customs labels. Only rarely have people requested that I alter that price for customs. Please don't. Transit time is generally 10-14 days to most countries, but once I had an order destined for Canada get routed through Mexico (and significantly delayed). Once it leaves me, it is out of my control and I cannot request tracking for 30 days. If your item is late, I will do everything in my power to track it down. Update 3/2019: I just had another order to Canada that traveled all over the US, to Canada, and then to MALAYSIA before it ended up right where it was supposed to over a month later! I am a bead addict, too, and I will make every effort to ship RTS purchases the same or next day. If I am unable to do so within 3 days, I will let you know in advance. I also do light jewelry repair, tumble-polishing (super-shiny, but not all stones and metals can be polished without some risk!-please convo me with details first), and oxidation for a nominal fee, plus you pay shipping costs. It's usually simple and quick, but takes time away from creating jewelry, which is my love and my therapy every day. As for custom orders, I love the challenges! Bring 'em! I have worked with several Buyers and made some pretty cool stuff. Check my sold items and my feedback to see what sold and what the buyer thought of the experience! I've had fun every time! ♥Again, thanks for checking my policies before you buy! Have a wonderful day! An occasional soak in warm soapy water (yes, except for soft/porous stones like turquoise, they are safe for showering, too!) will keep your item looking new, as will daily wear, which inhibits tarnish. For orders $25+ I also include a small polishing cloth which can be used on dry pieces until it is completely black. For shiny jewelry, I use a silver dip product for polishing. Just dip and then rinse in water. This will not remove black lettering. If the text lightens (common inside of bracelets), fill in the letters with a Sharpie. Best hack ever! Wipe off the excess ink while it is still wet and sand off remaining residue to make the lettering pop again. I include sanding paper in every stamped bracelet order.